MUMBAI: Not very long ago when Erik Solheim Executive Director of the United Nations (UN) Environment Programme was in Mumbai he went around the city to buy plastic cutlery as they wanted to shoot a video showing the need to do away with plastic. “Most shops we visited however said that if you want plastic cutlery you need to go to another state. 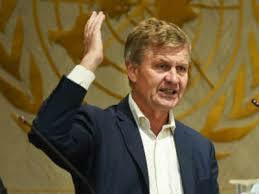 Probably one could get it somewhere else but the shops we visited said they did not sell it as its prohibited,” said Solheim ahead of the Global Climate Action Summit (GCAS) 2018 taking place in San Francisco during an interaction with journalists from across the world. Solheim further added that the policies put in place in Maharashtra to beat plastic pollution are absolutely remarkable. “Prime Minister Narendra Modi has promised to eliminate single use plastic by 2022 which is an extremely brave promise,” he said. This year the March 23 notification, brought under the Maharashtra Non-Biodegradable Garbage (Control) Act enacted in 2006, banned the manufacture, sale, transport, storage and use of plastic. From June 23, the civic inspectors took on streets to penalise those who are found to be using plastic. However several critics have said that the implementation of the policy is fairly poor as single use plastic can still be found in the markets. However Solheim’s said that the results of plastic reduction would take some time and cannot be seen in one day. Meanwhile when TOI asked Solheim on what’s the one thing that needs to be done to better the implementation he said there was a need for better return systems. “For instance in case of milk pouches if you put a small levy on them they will be brought in and can be recycled. Because when there is zero value people will just throw them away but even if you put one rupee it will be returned,” he said. GCAS 2018 is bringing together leaders, experts, and civil society members together from around the world to celebrate the extraordinary achievements of states, regions, cities, companies and citizens with respect to climate action. It will also witness deeper worldwide commitments to put the globe on track and to prevent climate change.